Stringfellow started with Southport Central, but in February, 1898 he was transferred to First Division Everton together with lnside left Jackie Kirwan for a fee of £130. He did not make the first team at Goodison and moved to Southern League Portsmouth in 1899. He was an instant hit and built up a good reputation, using his speed, positioning and accurate passing to outweigh his lack of inches in his pivot role in the centre of defence. It was not until 1904 that he made his next move to another Southern League club, Swindon Town, where he was installed as Captain. He made his debut on 1st September 1904 at home to Luton Town and he played thirty League and two F.A. Cup games before he had his last game on 29th April 1905 at home to Northampton Town. He moved to newly-elected Second Division Leeds City in July 1905. He made his debut at Centre Half in City’s first-ever Football League game at Valley Parade and scored once in thirteen League games and also played three times in the F.A. Cup. 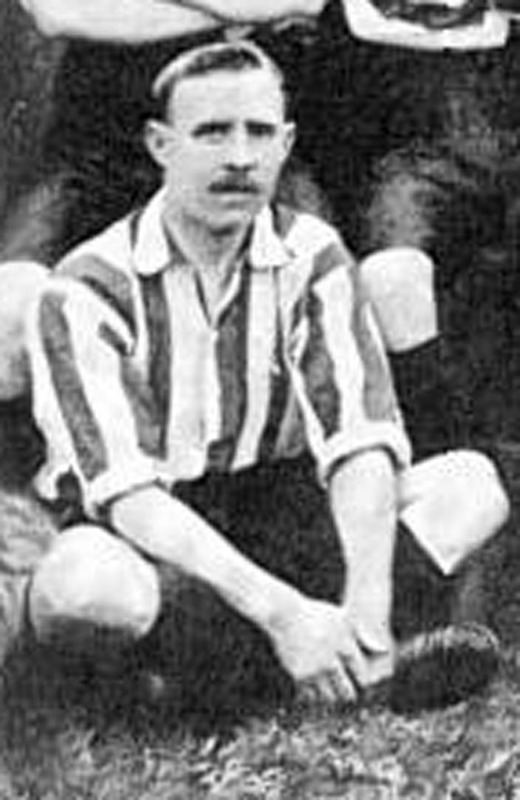 After only missing one of the first thirteen League games he fell out of favour and left for First Division Preston North End in September 1906 and soon found himself back in favour and scored twice in thirty-nine League games and had three F.A, Cup ties in the two seasons at Deepdale. He moved to Wigan Borough in 1908 where he played until he retired.